A Cake Bakes in Brooklyn: Peanut Biscuits -- Pure Genius! 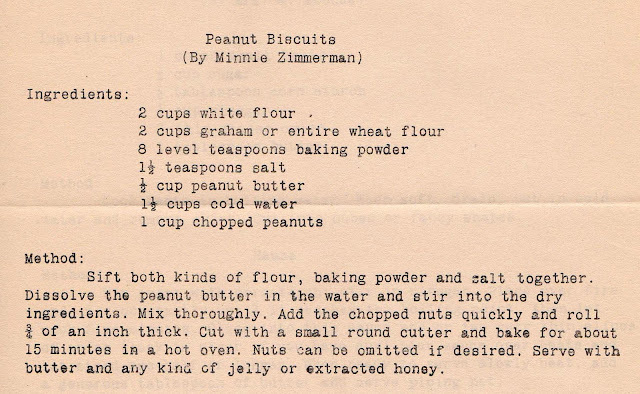 Peanut Biscuits -- Pure Genius! This is a long way to get to these excellent and unusual peanut biscuits, but after Kerlan left, and upon his advice, I began testing his theory by baking. And baking some more. First up were savory peanut biscuits -- easy and delicious. You'll need to chop up some peanuts. I used my brand new knife, a life changing purchase, that I got from Cut Brooklyn. Even bakers need good knives. If you like crunchy peanut butter, you will love these biscuits. They would also make a fine addition to the school lunchbox, something I haven't packed up in many years (and don't miss doing at all, thank you very much). The recipe, hand typed in Mrs. Grace Osborn's Cakes of Quality book, dates from the early 1900s. The biscuits deliver a double punch of peanut flavor, from both the peanuts and peanut butter. The recipe calls for eight teaspoons of baking powder. I kept count by placing each in a separate area atop the graham flour, below. This makes a very sturdy dough, which is a good thing because you need to roll it out. I used a bit of extra flour to insure it didn't stick to the rolling surface. This dough is fabulous raw. Do try some before baking. After baking, let them cool on a rack, though no one will mind if you have one hot from the oven. The best way to enjoy these biscuits is by creating a new twist on the PB & J. The biscuits serve as both the bread and the peanut butter -- just add jelly. I was lucky enough to have a jar of delicious homemade jam given to me by the fabulous food stylist Cyd McDowell who, if she was in my kitchen on Saturday, would have made this (and all the other photos) look much better. Some production notes: I used graham flour, which is pretty easy to find these days in those Red Mill displays. I assume that "entire wheat flour" is similar to what we today call whole wheat flour. I found it difficult, if not impossible, to dissolve the peanut butter in cold water, so I combined the two in my standing mixer and let it rip. And then I added the dry ingredients to the peanut butter mixture. Worked fine. I set the temperature at 400 degrees and baked them for about 11 minutes each. *For those interested in the denouement of the oven story: So, my oven would work sometimes, and completely fail others. In fact, the only time it was guaranteed to work was when the repair techs were there (which made me feel like I was being gaslighted even though the oven is electric). Kerlan heard my tale of woe and figured out that the oven door was not shutting properly, even though it looked like it was shut. This would explain why the oven worked only intermittently, i.e., when the door happened to shut correctly, the oven would attain and hold its temperature, but when it didn't, that would explain why it would stall at say 183 degrees and never heat up to 350. And because the repair techs always made sure to shut the oven door completely, it always worked perfectly for them. Kerlan ordered new door hinges, but in the meantime, I'm just mindful of the oven door and make sure it's completely closed. Problem solved, case closed. Jenopolis: Thanks, these are pretty good (and I don't even like peanut butter)! This recipe will be added to my "things to make for Dad" list. He loves peanuts/peanut butter and he loves biscuits: win-win. And it sounds like figuring out what was wrong with your oven was a win-win: a rather easy fix and still operable in the meantime. Happy baking! Thanks, Dawn! Yes, the oven story is the kind of happy ending I love! These biscuits look delicious. I can just imagine the relief you feel to finally know what the problems was with your oven. It is also a good thing that it was not a problem that is expensive to fix. Thanks,collarcitybrownstone. And since a week ago Friday, my oven is working perfectly! So no more mishaps, hopefully. I just found your blog and am SO HAPPY. Thank you so much for sharing, please keep it going! Thanks so much. I'll check out yours in a bit -- love the name! I'm not a big fan of rolling stuff out, and wondered if you thought these would work as dropped biscuits. I really enjoy your blog. Barbara -- I think they'd be fine, but do try to smooth the tops a bit. Or you could roll into balls and press flat with the back of a glass for a more polished look. Rolling out the dough is the most efficient way to go, though. Happy (belated) Birthday, Julia Child!